THE lobby of the Cosmopolis Hotel was a favorite stamping-ground of Mr. Daniel Brewster, its proprietor. He liked to wander about there, keeping a paternal eye on things, rather in the manner of the jolly innkeeper of the old-fashioned novel. Customers who, hurrying in to dinner, tripped over Mr. Brewster were apt to mistake him for the house detective, for his eye was keen and his aspect a trifle austere, but, nevertheless, he was being as jolly an innkeeper as he knew how. His presence in the lobby supplied a personal touch to the Cosmopolis which other New York hotels lacked, and it undeniably made the girl at the news-stand extraordinarily civil to her clients, which was all to the good. Most of the time, Mr. Brewster stood in one spot and just looked thoughtful; but now and again he would wander to the marble slab behind which he kept the desk clerk and run his eye over the register to see who had booked rooms—like a child examining the stocking on Christmas morning to ascertain what Santa Claus had brought him. As a rule, Mr. Brewster concluded this performance by shoving the book back across the marble slab and resuming his meditations. But one night in the early spring, he varied this procedure by starting rather violently, turning purple, and uttering an exclamation which was manifestly an exclamation of chagrin. 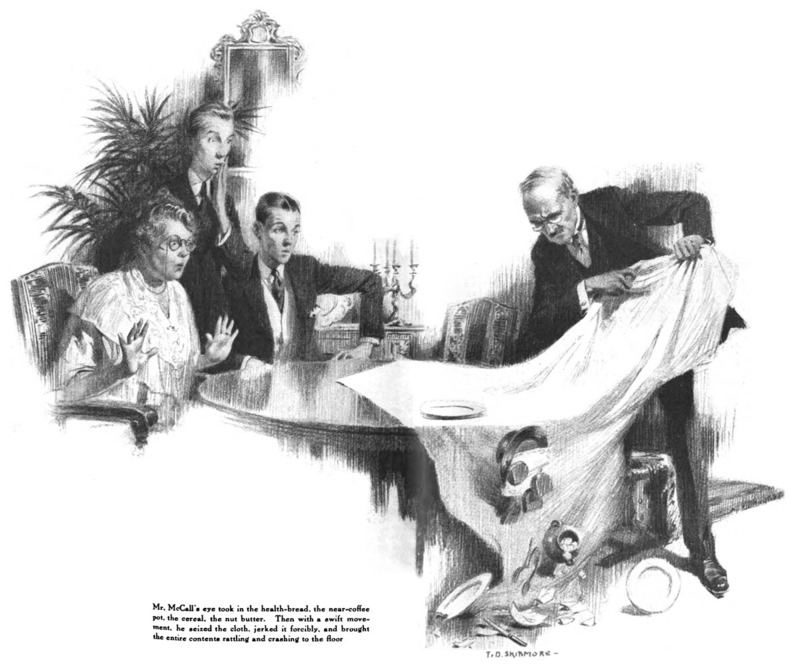 He turned abruptly and cannoned into his son-in-law, Archie Moffam, who, in company with Lucille, his wife, happened to be crossing the lobby at the moment on his way to dine in their suite. Mr. Brewster apologized gruffly, then, recognizing the victim, seemed to regret having done so. “Oh, it’s you! Why can’t you look where you’re going?” he demanded. He had suffered much from his son-in-law. “Give you lessons at a reasonable rate,” murmured Archie. Mr. Brewster regarded his young relative with a lowering eye. Lucille steered her husband out of the danger-zone, and they entered the elevator. “We all do that,” said Archie, the married man. Archie was at the telephone. His mood was now one of quiet peace. Of all the happenings which went to make up existence in New York, he liked best the cozy, tête-à-tête dinners with Lucille in their suite, which, owing to their many engagements—for Lucille was a popular girl, with many friends—occurred all too seldom. He unhooked the receiver, and asked despondently to be connected with “room-service.” He thought bitterly of the exigent Jane, whom he recollected dimly as a tall female with teeth. He half thought of going down to the grill-room on the chance of finding a friend there, but the waiter was on his way to the room. He decided that he might as well stay where he was. The waiter arrived, booked the order, and departed. Archie had just completed his toilet after a shower-bath when a musical clinking without announced the advent of the meal. He opened the door. The waiter was there with a table congested with things under covers, from which escaped a savory and appetizing odor. In spite of his depression, Archie’s soul perked up a trifle. Suddenly he became aware that he was not the only person present who was deriving enjoyment from the scent of the meal. Standing beside the waiter and gazing wistfully at the foodstuffs was a long, thin boy of about sixteen. He was one of those boys who seem all legs and knuckles. He had pale-red hair, sandy eyelashes, and a long neck; and his eyes, as he removed them from the table and raised them to Archie’s, had a hungry look. Before Archie could reply, the telephone-bell rang. It was Lucille, confirming her prophecy that the pest Jane would insist on her staying to dine. The waiter left. The long boy hitched his back more firmly against the door-post and returned to his original theme. “Golly!” said the boy reverently. “You’ve dined, I suppose—what?” said Archie. “I don’t absolutely catch the drift, old bean,” said Archie. The boy sniffed with half-closed eyes as a wave of perfume from the poulet en casserole floated past him. He seemed to be anxious to intercept as much of it as possible before it got through the door. 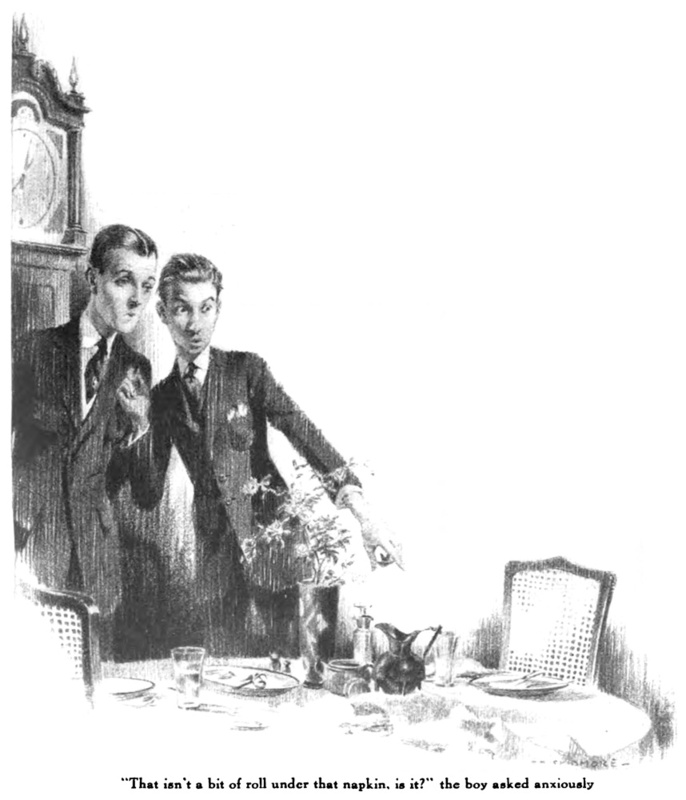 Archie was not a man with a wide visiting-list among people with families, and it was so long since he had seen a growing boy in action at the table that he had forgotten what sixteen is capable of doing with a knife and fork when it really squares its elbows, takes a deep breath, and gets going. The spectacle which he witnessed was consequently at first a little unnerving. The long boy’s idea of trifling with a meal appeared to be to swallow it whole and reach out for more. He ate like a starving Eskimo. Archie, in the time he had spent in the trenches making the world safe for the working man to strike in, had occasionally been quite peckish, but he sat dazed before this majestic hunger. This was real eating. “She’s got a great line of talk,” conceded the boy. “She’s out tonight on the West Side somewhere, giving a lecture on rational eating to some ginks down there. I’ll have to be slipping up to our suite before she gets back.” He rose sluggishly. “That isn’t a bit of roll under that napkin, is it?” he asked anxiously. The long boy removed himself slowly, loath to leave. At the door, he cast an affectionate glance back at the table. Archie lighted a cigarette. He felt like a boy scout who has done his day’s act of kindness. On the following morning, it chanced that Archie needed a fresh supply of tobacco. It was his custom, when this happened, to repair to a small shop on Sixth Avenue which he had discovered accidentally in the course of his rambles about the great city. His relations with Joe Blake, the proprietor, were friendly and intimate. 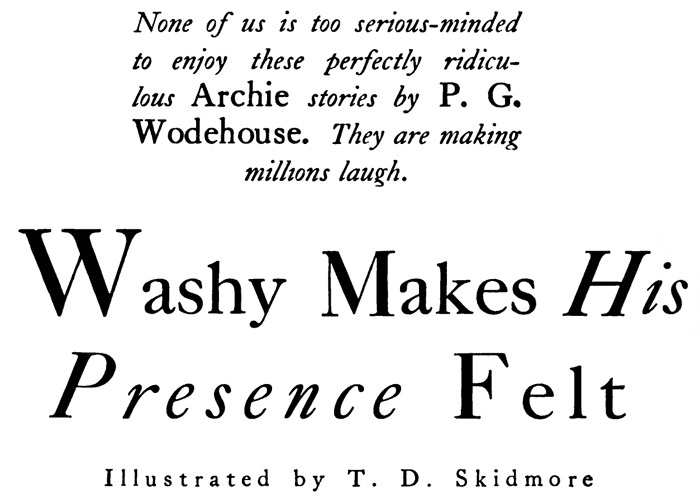 The discovery that Mr. Blake was English and had, indeed, until a few years back, maintained an establishment only a dozen doors or so from Archie’s London club had served as a bond. To-day, he found Mr. Blake in depressed mood. 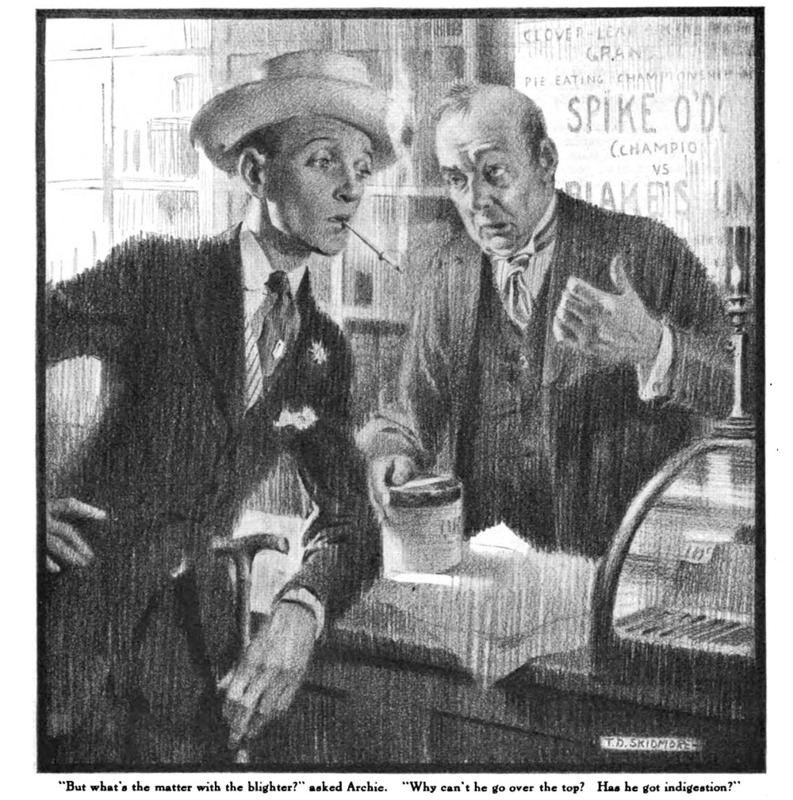 The tobacconist was a hearty and a red-faced man who looked like an English sporting publican—the kind of man who wears a fawn-colored top-coat and drives to the Derby in a dog-cart, and usually there seemed to be nothing on his mind except the vagaries of the weather, concerning which he was a great conversationalist. But now moodiness had claimed him for its own. After a short and melancholy good-morning, he turned to get the tobacco in silence. Mr. Blake, with a jerk of his thumb, indicated a poster which hung on the wall behind the counter. Archie had noticed it as he came in, for it was designed to attract the eye. It was printed in black letters on a yellow ground, and ran as follows. “ ‘In the midst of life.’ Dead?” he inquired delicately. Archie stopped in his tracks. A pedestrian, walking behind him, charged into his back, but Archie paid no attention. He had had one of those sudden, luminous ideas which help a man who does not do much thinking as a rule to restore his average. He stood there for a moment, almost dizzy at the brilliance of his thoughts, then hurried on. Napoleon, he mused, as he walked, must have felt rather like this after thinking up a hot one to spring on the enemy. As if Destiny were suiting her plans to his, one of the first persons he saw as he entered the lobby of the Cosmopolis was the long boy. He was standing at the news-stand, reading as much of a morning paper as could be read free under the vigilant eyes of the presiding girl. Both he and she were observing the unwritten rules which govern these affairs—to wit, that you may read without interference as much as can be read without touching the paper. If you touch the paper, you lose and have to buy. They found Mr. Blake brooding over his troubles still. “Some people have all the luck!” said the long boy feelingly. “Pie!” he said, in a hushed voice. At about nine o’clock on the following morning, in a suite at the Hotel Cosmopolis, Mrs. Cora Bates McCall, the eminent lecturer on rational eating, was seated at breakfast with her family. Before her sat Mr. McCall, a little, hunted-looking man, the natural peculiarities of whose face were accentuated by a pair of glasses of semicircular shape, like half-moons with the horns turned up. Behind these, Mr. McCall’s eyes played a perpetual game of peek-a-boo, now peering up over them, anon ducking down and hiding behind them. He was sipping a cup of anti-caffein. On his right, toying listlessly with a plateful of cereal, sat his son Washington. Mrs. McCall herself was eating a slice of health-bread and nut butter. For she practised as well as preached the doctrines which she had striven for so many years to inculcate in an unthinking populace. Her day always began with a light but nutritious breakfast, at which a peculiarly uninviting cereal, which looked and tasted like an old straw hat that had been run through a meat-chopper, competed for first place in the dislike of her husband and son with a more than usually offensive brand of imitation coffee. Mr. McCall was inclined to think that he loathed the near-coffee rather more than the cereal, but Washington held strong views on the latter’s superior ghastliness. Both Washington and his father, however, would have been fair-minded enough to admit that it was a close thing. The heir of the McCalls looked up from his cereal. It seemed that the habit of shuddering at the thought of pie ran in the McCall family, for, at the mention of the word, a kind of internal shimmy had convulsed Washington’s lean frame, and over his face there had come an expression that was almost one of pain. He had been reaching out his hand for a slice of health-bread, but now he withdrew it rather hurriedly and sat back, breathing hard. “I’m all right,” he said huskily. All through breakfast, the New York Chronicle had been lying neatly folded beside her plate. She now opened it, and, with a remark about looking for the report of her yesterday’s lecture at the Butterfly Club, directed her gaze at the front page, on which she hoped that a city editor with the best interests of the public at heart, had decided to place her. Mr. McCall, jumping up and down behind his glasses, scrutinized her face closely as she began to read. He always did this on these occasions, for none knew better than he that his comfort for the day depended largely on some unknown reporter whom he had never met. If this unseen individual had done his work properly, and as befitted the importance of his subject, Mrs. McCall’s mood for the next twelve hours would be as uniformly sunny as it was possible for it to be. But sometimes the fellows scamped their jobs disgracefully, and once, on a day which lived in Mr. McCall’s memory, they had failed to make a report at all. To-day, he noted with relief, all seemed to be well. The story actually was on the front page, an honor rarely accorded to his wife’s utterances. Moreover, judging from the time it took her to read the thing, she had evidently been reported at length. His wife had recovered the paper, and was reading with burning eyes. A bright wave of color had flowed over her masterful features. She was breathing as stertorously as ever her son Washington had done on the previous night. He looked at the paper, and received immediate enlightenment. Head-lines met his eye. There followed a lyrical outburst. So uplifted had the reporter evidently felt by the importance of his news that he had been unable to confine himself to prose. My children, if you fail to shine or triumph in your special line; if, let us say, your hopes are bent on some day being President, and folks ignore your proper worth and say you’ve not a chance on earth, cheer up, for, in these stirring days, fame may be won in many ways. Consider, when your spirits fall, the case of Washington McCall. Yes; cast your eye on Washy, please! He looks just like a piece of cheese. He’s not a brilliant sort of chap. He has a dull and vacant map; his eyes are blank; his face is red; his ears stick out beside his head. In fact, to end these compliments, he would be dear at thirty cents. Yet Fame has welcomed to her hall this self-same Washington McCall. His mother (née Miss Cora Bates) is one who frequently orates upon the proper kind of food which every menu should include. With eloquence the world she weans from chops and steaks and pork and beans. Such horrid things she’d like to crush and make us live on milk and mush. But, oh, the thing that makes her sigh is when she sees us eating pie! (We heard her lecture last July upon “The Nation’s Menace—Pie.”) Alas, the hit it made was small with Master Washington McCall! For yesterday we took a trip to see the great pie-eating championship, where men with bulging cheeks and eyes consume vast quantities of pies. A fashionable West Side crowd beheld the champion, Spike O’Dowd, endeavor to defend his throne against an upstart, Blake’s Unknown. He wasn’t an Unknown at all. He was young Washington McCall. We freely own we’d give a leg if we could borrow, steal, or beg the skill old Homer used to show. (He wrote the “Iliad,” you know.) Old Homer swung a wicked pen, but we are ordinary men, and cannot even start to dream of doing justice to our theme. The subject of that great repast is too magnificent and vast. We can’t describe (or even try) the way those rivals wolfed their pie. Enough to say that, when, for hours, each had extended all his powers, toward the quiet evenfall, O’Dowd succumbed to young McCall. The champion was a willing lad. He gave the public all he had. His was a genuine fighting soul. He’d lots of speed and much control. No yellow streak did he evince; he tackled apple pie and mince. This was the motto on his shield: “O’Dowds may burst. They never yield.” His eyes began to start and roll. He eased his belt another hole. Poor fellow! With a single glance, one saw that he had not a chance. A python would have had to crawl and own defeat from young McCall. At last—long last—the finish came. His features overcast with shame, O’Dowd, who’d faltered once or twice, declined to eat another slice. He tottered off, and kindly men rallied round with oxygen. But Washy, Cora Bates’s son, seemed disappointed it was done. He somehow made those present feel he’d barely started on his meal. We asked him, “Aren’t you feeling bad?” “Me!” said the lion-hearted lad. “Lead me”—he started for the street—“where I can get a bite to eat.” Oh, what a lesson does it teach to all of us, that splendid speech! How better can the curtain fall on Master Washington McCall? Mr. McCall read this epic through; then he looked at his son. If such a thing had not been so impossible, one would have said that his gaze had in it something of respect, of admiration, even of reverence. His stumbling defense was cut short by the opening of the door. 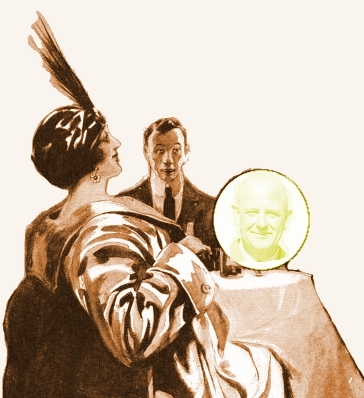 The apparition of an entire stranger served to divert the lightning of Mrs. McCall’s gaze from the unfortunate Washy. Archie, catching it between the eyes, blinked and held on to the wall. He began to regret that he had yielded to Lucille’s entreaty that he should look in on the McCalls and use the magnetism of his personality upon them in the hope of inducing them to settle the lawsuit. Archie took an uninvited seat, eyed the health-bread on the breakfast table for a moment with frank curiosity, and resumed his discourse. So engrossed had he been in his appeal that he had not observed the presence of the pie-eating champion of the West Side. But now Washington, hearing the familiar voice, had moved from the window and was confronting him with an accusing stare. For many years, Mr. McCall had been in a state of suppressed revolution. He had smoldered, but had not dared to blaze. But this startling upheaval of his fellow sufferer, Washy, had acted upon him like a high explosive. There was a strange gleam in his eye, a gleam of determination. He was breathing hard. Mr. McCall dropped his glasses. He glowered for a moment at the breakfast-table. His eye took in the health-bread, the near-coffee pot, the cereal, the nut butter. Then with a swift movement, he seized the cloth, jerked it forcibly, and brought the entire contents rattling and crashing to the floor. Mr. McCall met his wife’s eye with quiet determination. The next escapade of Archie in America will appear in November Cosmopolitan. A few obvious comma and period mistakes in typesetting have been silently corrected.